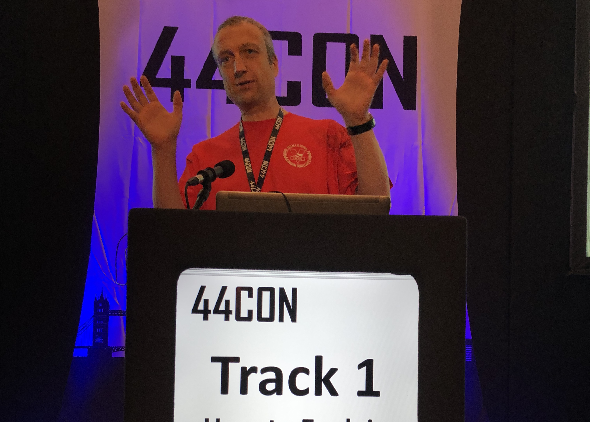 How to Explain Post-Quantum Cryptography to a Middle School Student, was the title of a presentation I gave at the 44CON conference in London last Friday. Post-quantum cryptography, one of the hottest topics in IT security today, addresses asymmetric crypto systems that are not prone to quantum computers. Virtually all asymmetric crypto systems currently in use (especially, Diffie-Hellman, RSA, DSA, and Elliptic Curve crypto systems) are not post-quantum. They will be useless, once advanced quantum computers will be available. Quantum computer technology has made considerable progress in recent years, with major organisations, like Google, NSA, and NASA, investing in it. Post-quantum cryptography uses advanced mathematical concepts. Even if one knows the basics of current asymmetric cryptography (integer factorisation, discrete logarithms, …), Post-quantum algorithms are hard to understand. The goal of my presentation was to explain post-quantum cryptography in a way that is comprehensible for non-mathematicians. 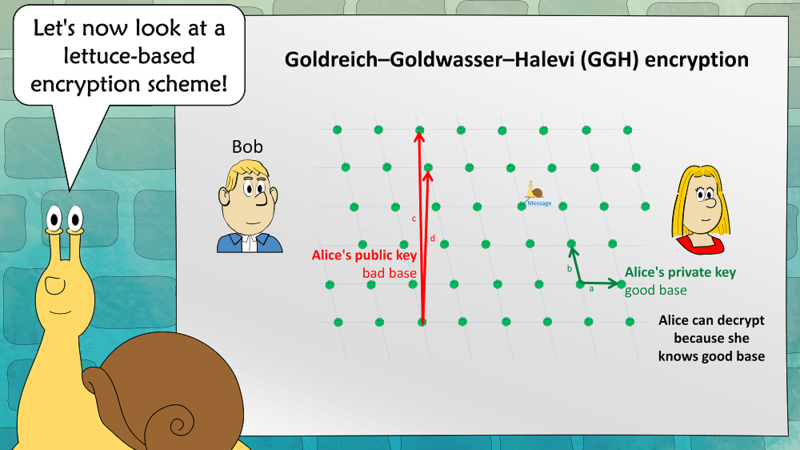 One of the post-quantum methods I explained is the so-called GGH algorithm (named for its inventors Goldreich, Goldwasser, and Halevi). GGH is a lattice-based crypto algorithm. 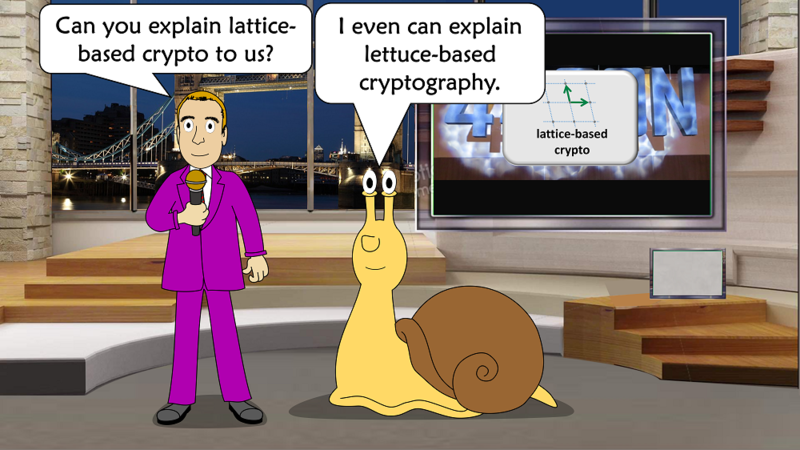 But how can one explain lattice-based cryptography in an entertaining and easy-to-understand way? 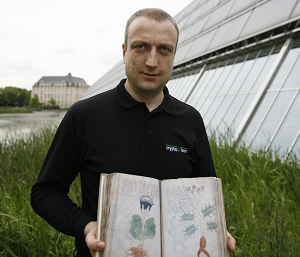 My co-worker Daniel Rocholz from cryptovision had a great idea: explain it from the point-of-view of a snail. The following presentation slides show how I put Daniel’s idea into practice. 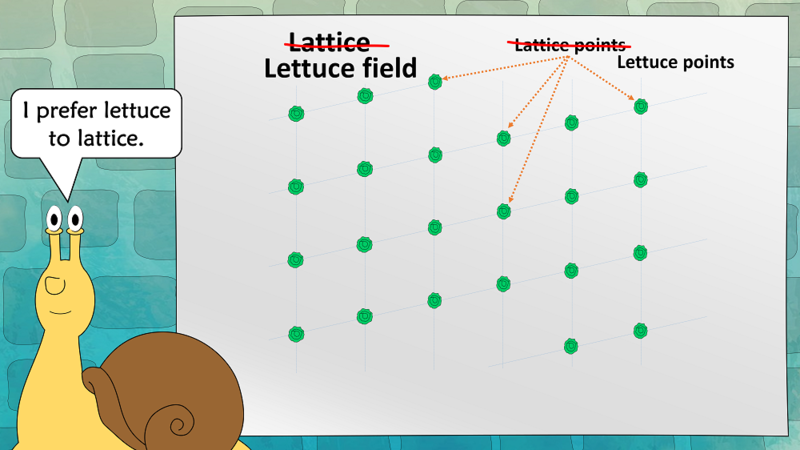 If we assume that we are in a high-dimensional lettuce field, this problem is easy to solve with a good base, but hard to solve with a bad base. Alices public key is a bad base, her private key is a good base. To encrypt, Bob places a snail near a lettuce. 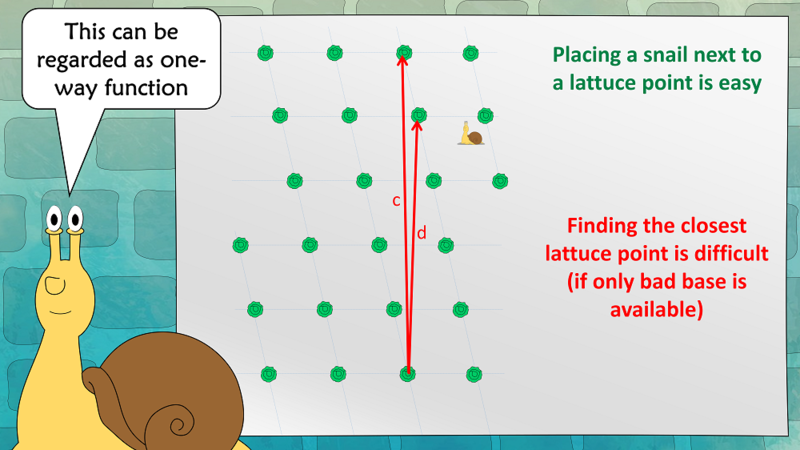 The vector between the snail and the lettuce is the cleartext (in practice, the lettuce field is about 250-dimensional, which means that this vector can easily encode a 128 bit message). Alice can easily find the closest lettuce (and thus decrypt the message), as she knows a good base. An attacker can’t, as he has only a bad base. That’s it. This isn’t very difficult, is it? Unfortunately, GGH has proven insecure, so it should not be used in practice. However, there are other lattice-/lettuce-based encryption schemes, that are considered secure, like NTRU, (R)LWE, and New Hope. 27 algorithms of this kind have been handed in to the NIST Post-Quantum Competition. I’m pretty sure that several of them will be among the winners. Well I felt like a vegetable just trying to understand even the snail version. Maybe I’ll try again tomato… I mean, tomorrow. keep the snail and the lettuces in their mind and so they got the idea. 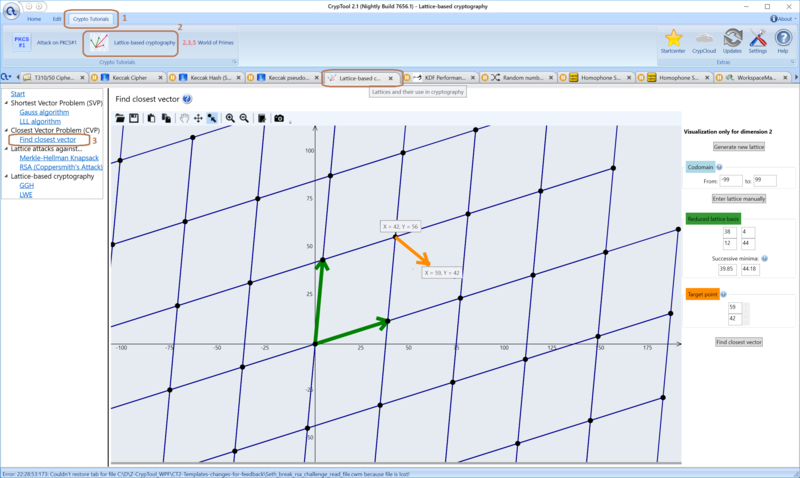 them you don’t span the whole plane as vector space, but only the lattice. 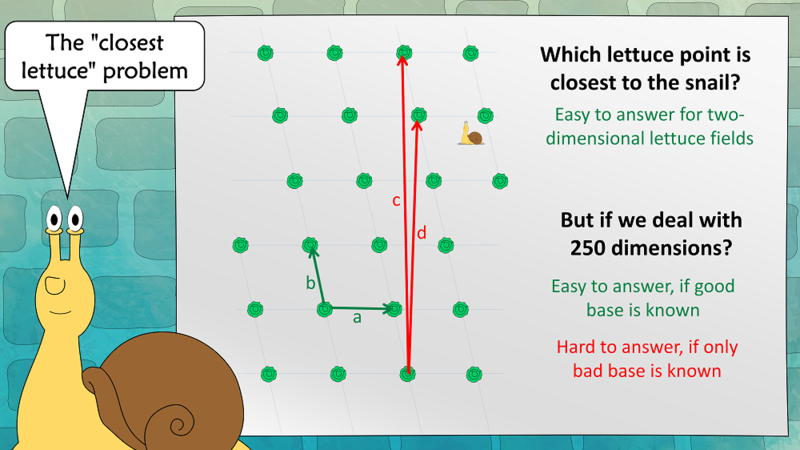 ideas of the easiest problems and methods in 2 dimensions graphically. way to the closest lattice point (42/56). If I have understood the method correctly, then it relies on a private key (which is a good base) in which the solution is easy to find, while the public key (a bad base) just allows you to ask the problem and check the result, but finding the nearest lattice point is a hard problem. 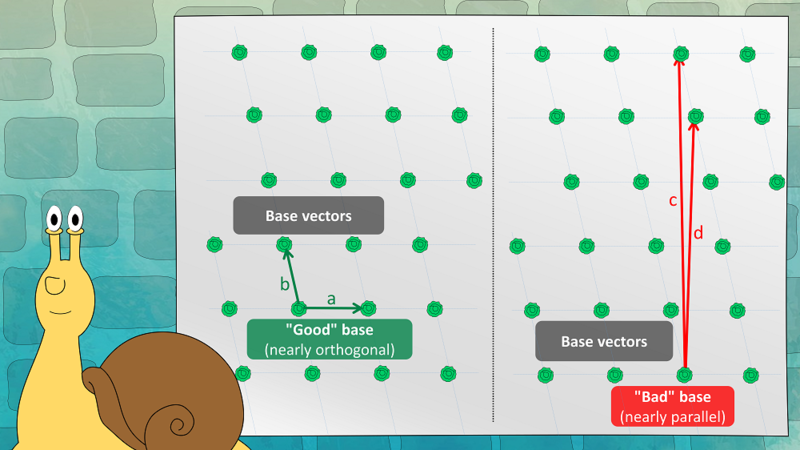 On the other hand, orthonalizing a given base is not really difficult, even in a few hundred dimensions. What prevents an attacker from converting a bad into a good base? >attacker from converting a bad into a good base? As far as I know, deriving a good base from a bad one is difficult (at least, it is extremely laborious). Otherwise, this scheme would not work. It’s difficult in the discrete space in contrast to the continuous space. @BE Thanks, the ‘discrete’ information was missing (at least, for me). Whatever a ‘discrete’ basis is. The usual way of orthogonalizing a basis (Gram-Schmidt) will result in rational numbers in the basis. So they will fall in between the lattice points. A discrete basis in this situation means it has to stick to the lattice points.